The Multisports MG-200 Home Gym is constructed with heavy gauge steel which ensures strength, stability, and durability. Multisports uses reinforced nylon pulleys with sealed steel bearings and nylon coated aircraft cable rated at 2000 lb. tensile strength to give a smooth, quiet, and durable response for an intense workout. The company uses only high density foam upholstery with stitched seams which provide long lasting comfort and durability. The MultiSports MG-200 Home Gym is a multi-station home gym comes with a single 200 lb. weight stack. 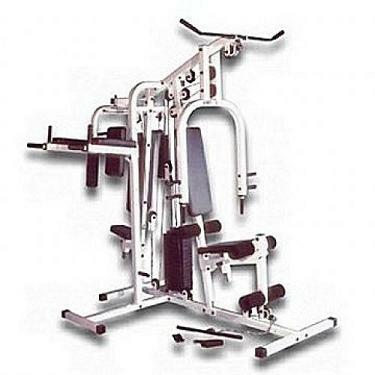 The MultiSports MG-200 Home Gym stations included with this machine are a press, high pulley, low pulley, and leg extension/curl. Other stations can be added such as a pec deck (MG-PD) and a vertical knee raise (MG-VKR). For comfort and proper positioning when exercising the MG-200 is a equipped with an adjustable seat. The machine is protected by a limited lifetime warranty on frames and welds and 1 year on moving parts (cables, pulleys). Order your MultiSports MG-200 Home Gym from FitnessZone.com today! Optional stations include a pec deck (MG-PD, Squat Station (MG-SQ) and a VKR (MG-VKR). Adjustable seat positions allow proper positioning when exercising.